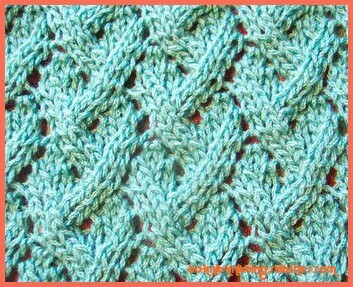 Here is another lace stitch pattern I like - A Loose Lattice Lace stitch pattern. 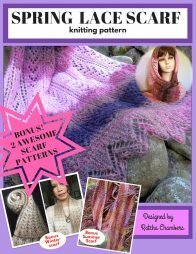 The pattern is not too complicated for beginning knitters. I love it even more when I only have purl stitches on the wrong side. Just make sure that you keep track of each row you working on. Use a row counter or a pen to mark off each row your complete to avoid mistake. It's not easy to make a correction once you make a mistake. The best thing to do when mistake happens is to take the whole row off and start knitting from the beginning of the row again. Knit on Multiple of 8 stitches + 3. Noted: Stitches should only be counted after the 5th, 6th, 11th and 12th rows. Row 1 (right side): K1, *k2tog, k1, yf, k1, sl 1, k1, psso, k2; rep from * to last 2 sts, k2. Row 2 and every alternated row: Purl. Row 3: *K2tog, k1, [yf, k1] twice, sl 1, k1, psso; rep from * to last 3 sts, k3. Row 5: K2, *yf, k3, yf, k1, sl 1, k1, psso, k1; rep from * to last st, k1. Row 7: K4, *k2tog, k1, yf, k1, sl 1, k1, psso, k2; rep from * to last 7 sts, k2tog, k1, yf, k1, sl 1, k1, psso, k1. Row 9: K3, *k2tog, k1, [yf, k1] twice, sl 1, k1, psso; rep from * to end. Row 11: K2, *k2tog, k1, yf, k3, yf, k1; rep from * to last st, k1. Repeat these 12 rows to form Loose Lattice Lace pattern. 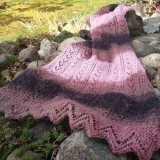 I have made several tutorial mini series on this pattern and a full length version. For short videos, you can follow links at the end of each clip to continue to the next part. It contain part 1 through part 7. Don't forget to expand video to full screen for better picture. You can find expanding button at the bottom right corner.